Food donations made by Croydon Council staff for the poor and vulnerable over Christmas were distributed directly by local social services ahead of the holiday break, sources have confirmed to Inside Croydon. Croydon Council’s annual charity food collection was previously highlighted by Inside Croydon here. The inappropriateness of staging the collection as a “competition” seems lost on our council’s six-figure salaried execs, as did the bitter irony that staff in the department within Croydon’s £140 million new headquarters offices which collected the most food donations would be rewarded with… a food hamper. Few would argue with providing food aid directly to those in greatest need. But it is surely signal of the dire poverty and need of some of the most vulnerable in Croydon in the 21st century that our local authority’s social services department is having to hand out food donations. The Croydon Food Network, which works together with the council and was due to receive the food donations, is relatively relaxed about social services’ involvement in the aid distribution. “We have known about this,” one charity volunteer told Inside Croydon. “Some amount of the food collected was set aside for the social services department for families they know to be in greatest need. “We get most of our referrals from social services, so if social services decide that they have food that can help someone, in the end it doesn’t matter much whether they give it to them, or that we do. And if they decide that’s how they want to distribute the donations they have received, it’s not our prerogative to say otherwise,” the volunteer said. 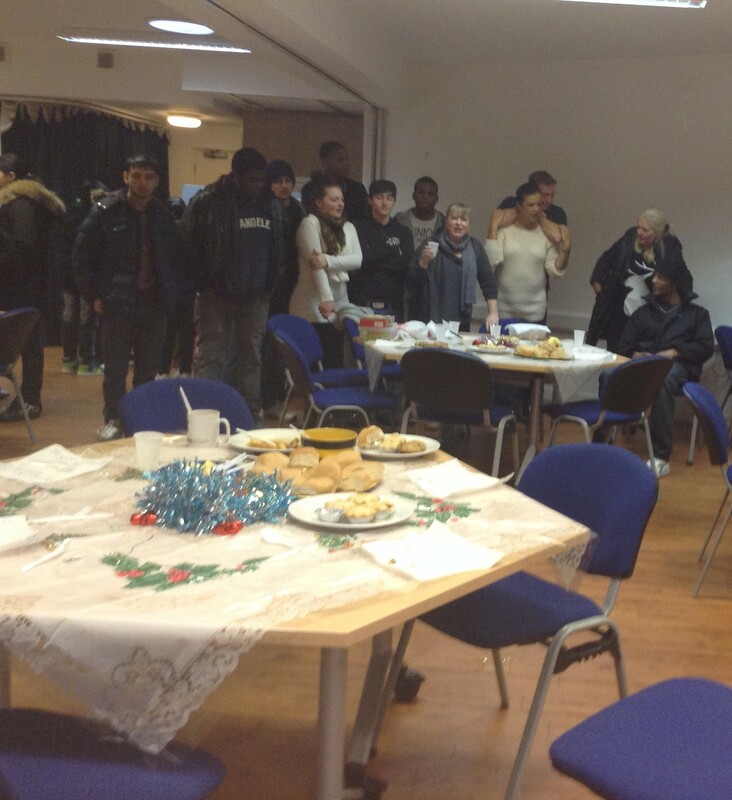 On Christmas day, the Croydon Food Network cooked and served Christmas lunch for 50 people at the CVA building on London Road. Following the festive generosity of December, the Network faces the grim winter months of early 2014 when the need for food relief continues undiminished. Finding somewhere dry, secure and safe to store donations is a continuing problem, and getting assistance to transport donated food around the borough is another. How did your Croydon MP vote when parliament was asked to reveal a government report on food banks? This entry was posted in Charity, Community associations, Croydon Council, Croydon Nightwatch and tagged Christmas, Croydon, Croydon Council, Food Network, London, London Borough of Croydon, Upper Norwood Library. Bookmark the permalink.